Okay this is for the person who has a pet and is obsessed with their pet’s shenanigans. In addition they have to also love Twitter messages that are more mindless than most and we know Twitter is not a place filled with mindless tweets, cough! Introducing Puppy Tweets! 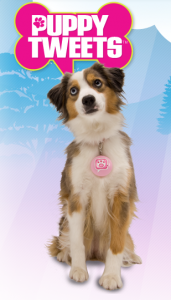 The good folks at Mattel are teaching kids the value of K-9 social media, well thank God someone is! Apparently after you hook the tracking puppy tag, any time your dog moves or barks you are sent a tweet. I am a firm believer that once I leave the house my dog puts on my bath robe, turns on the stereo, and gets on the computer and browses the web all day in addition to ordering the occasional home delivered pizza. Of course some dogs may sleep all day- in which case you won’t get many tweets. However in the case of the all day yapper- you may get 100’s of tweets that say “your dog just barked.” Perhaps there will be an occasional tweet that says “your dog just drank water.” As you can see this is a fascinating and incredibly rich experience. The prize jewel of tweets will be when you get one that says “Your dog just pooped on your rug and tracked it all over house.” That is sure to brighten your day and give you something to look forward to when you get home. Puppy Tweets is PC and Mac compatible so everyone can jump in on the fun. In closing, the one thing I love about technology is taking it and subverting its intended use. I think the device and software for puppy tweets, may have some other sinister use and I can’t wait to find it!